Historic sites and house museums probably represent the largest type of museum in the United States, and yet less than a handful of books or articles have been written about the interpretation of historic sites in the last fifty years. Part of this weakness can be attributed to the usual “last place” position that historic sites hold in terms of funding, staffing, and other resources, but it can also be due to the additional complexity of historic sites compared to other educational and cultural institutions. If you imagine interpretation as a melody, most museums can choose from all the keys on a piano and play the notes as desired, whereas historic sites have to play specific notes, such as the buildings and landscapes, and often in a certain order. Nevertheless, all museums have to address three primary areas to effectively teach and educate: content, audience, and method. Content: This comprises all the potential and unique messages, resources, and assets available. For historic sites, this would include its archives, artifacts, buildings, and landscapes as well as its intangible intellectual assets, such as research, scholarship, messages, topics, themes, mission, and vision which may be codified on paper as reports or maintained in the minds of its staff and board. Audience: All the potential individuals, families, groups, organizations, residents, tourists, members, and donors that can engage with the institution, on site or off site, can be called an audience. Because these are human beings, it’s a particularly complex element because each person arrives (or avoids) a site because of their unique interests, motivations, preferences, and attitudes. 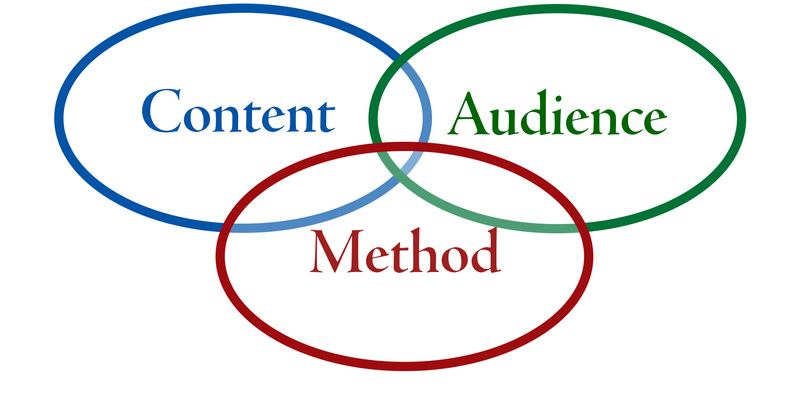 Method: This represents the many and varied ways of sharing, distributing, and transmitting the content to the audience. Historic sites commonly use tours, exhibits, period rooms, events, festivals, school programs, lectures, concerts, film, audiotours, wayside markers, newsletters, brochures, and books, and increasingly in this digital age, websites, blogs, Facebook, Twitter, online catalogs, e-newsletters, video, podcasts, and augmented reality. These new tools not only allow us to reach new audiences but also prompt a rethinking of the communication process—it is not simply a speech directed from museum to visitor, but a conversation between the museum and its participants. Methods are communication tools or strategies that link content and audience, providing the essential bridge between the site and its visitors, users, and supporters. Different audiences may prefer different experiences, for example a scavenger hunt for fourth graders, a smartphone application for young adults, and a curator-led tour for collectors. The same content can be presented differently, such as a guided tour of period rooms, a virtual tour online, or an illustrated book of scholarly essays. With so many opportunities, it’s easy to be pulled in many directions at one time but interpretive planning provides a process for making wise choices and strategic decisions. Interpretive planning evaluates the content, audience, and methods to determine how, when, and where to bring them together using the time and money available. Even better, good planning can help launch implementation and build in sustainability so it isn’t merely an unfilled dream or a short-lived effort. Interpretive planning is finding where the three elements intersect and overlap—the harmony among the three parts. Success doesn’t happen naturally or accidently—it’s a result of finding balance among mission, money, discipline, and innovation. Maintaining this balance is especially crucial in non-profit organizations because they often work with limited resources to achieve ambitious goals. Interpretive planning can help achieve this balance no matter the size or age of your organization, and can be phased or scaled according to your needs, from refining topics and themes, to exploring visitor motivations and learning preferences, and to measuring organizational capacity to identify those methods that are most effective and sustainable. And although organizations often focus on the final product—the plan—the process of planning is just as vital for strengthening and building capacity. This article is also available as a two-page pdf and you’re welcome to use it for in-house training or classroom teaching. This entry was posted in Historical interpretation on December 4, 2012 by Max van Balgooy.